Dealextreme.com, a company from Hong Kong, offers all kinds of inexpensive goodies. Customers can pay with PayPal, and shipping is free. Interested in a laser pointer for less than two dollars or a SATA/IDE adapter for just eight dollars? If you don't mind waiting up to two weeks for delivery, you're guaranteed to find a bargain with Dealextreme. 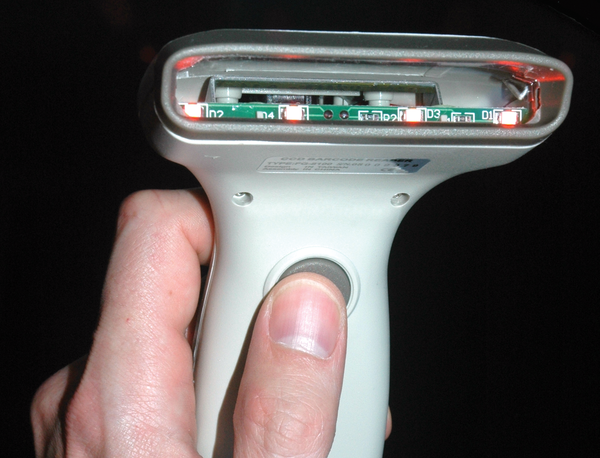 For quite a while I had my eye on the CCD-based barcode scanner for US$ 42 dollars (see Figure 1) (one of Dealextreme's most expensive products ) before I finally pressed the Buy button. 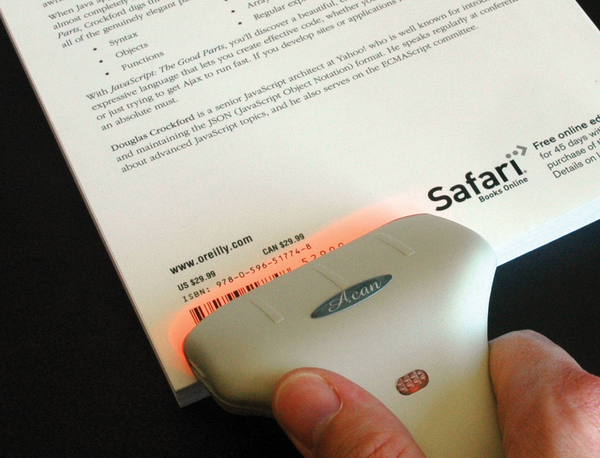 Figure 1: The barcode scanner can read the UPC or EAN code on a book. When the mailman finally delivered the package, I could hardly wait to get started. The obvious choice was to write an application to scan the barcodes in my extensive collection of technical literature and store the results in a database. Depending on where the book comes from, the barcodes are either printed in UPC (Universal Product Number) or EAN (European Article Number) format, and Amazon.com offers a free web service that gives you detailed product information if you submit either barcode. 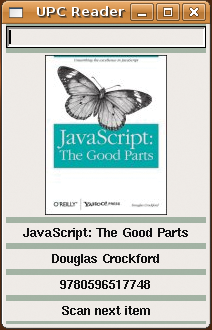 This means that a Perl script can easily identify the author and title of a book or the artist for a CD that you scan. The data returned by the service includes CD and book cover images. Adding a graphical user interface to the application lets me display the book cover or CD case onscreen and in color after scanning. The reader has a USB connector, and Linux immediately identifies it as a second keyboard. If you hold the sensor over the barcode of a book, CD, or DVD and press the button, the scanner switches the red light on (Figure 2) and enables the CCD sensor; then, the internal CPU starts to analyze the bars of different thicknesses to discover the encoded number. Figure 2: The scanner has a CCD sensor and switches its red diodes on at the push of a button. The barcode scanner is very reliable; it beeps when it's done and sends the numbers to the computer's USB port, just as if the user had typed them at the keyboard and then pressed Return. If the scanner fails to identify the barcode, which did not happen in my experiments, the user can still type the number in the input box of the application discussed in this article – the effect is the same. The script, upcscan (Listing 1), uses a graphical interface based on the Tk toolkit. The GUI's text input box immediately grabs the keyboard focus when launched. Once the barcode scanner has identified a code, the numbers appear in the input box. The scanner sends a return key code when it is done, and the GUI responds with the callback function scan_done(). 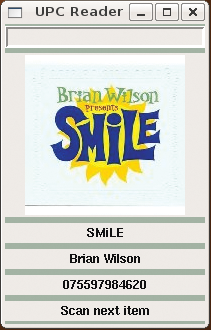 The function sends the barcode to the Amazon Web Services (AWS) and, after a delay of about a second, receives the title and author or artist of the book, CD, or DVD plus a URL that points to a JPEG image of the book or CD cover. Figure 3: The script has sent the scanned code to Amazon.com and received the product data in return. Figure 4: The scanner identifies CDs and DVDs by interpreting the UPC code and retrieves the product data and cover image from Amazon.com. Figure 5: The scanned article data is sent to the SQLite database. Thanks to the Tk package from CPAN, slick GUIs are no problem for Perl scripts. Unfortunately, I had a problem with the application I had in mind: Longer operations, such as the web requests, caused the interface to freeze. Querying Amazon with a barcode can take a couple of seconds, and the interface would freeze in the meantime. The POE module, also from CPAN, gave me a workaround – it lets the GUI run in an event-oriented userspace "kernel." However, don't confuse this with the Linux kernel; in POE, "kernel" is just a fancy name for an event loop. It provides mechanisms for cooperative multitasking. The script does not handle web requests synchronously in this environment; instead, it sends a request to the web server and then immediately hands control back to the POE kernel and, therefore, the GUI event loop. When the response comes back from the Internet, the kernel wakes up the waiting task and passes in the data. The Net::Amazon CPAN module handles communications with Amazon and supports a variety of requests to the giant retailer's web service. Internally, it does not use the asynchronous POE module to query the Amazon database. Instead, it uses the synchronous LWP::UserAgent. You can use the ua parameter to tell the module to work with a user agent that you pass in to it. CPAN has LWP::UserAgent::POE, an agent with an LWP interface that respects the special asynchronous needs of the POE kernel. While the module issues web requests, and seemingly waits synchronously for the results, some black magic inside the module allows the POE kernel to keep on ticking, thus giving other tasks their turn.